ZillowTrisha Yearwood's house in Brentwood, Tenn., has been the setting for her Food Network TV show. 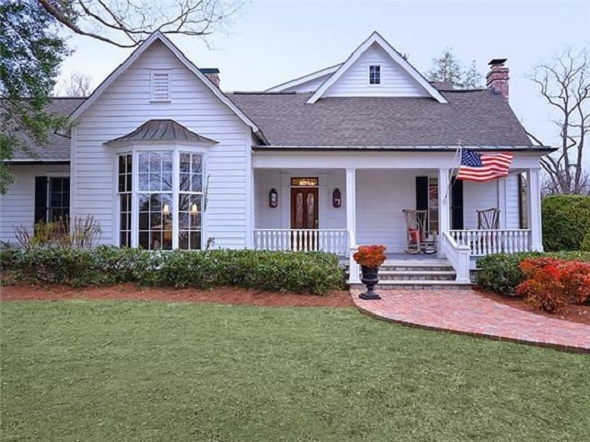 Country music star Trisha Yearwood is selling her countryside home outside Nashville. The charming white house has been the setting for the Grammy-winner's Food Network TV show, "Trisha's Southern Kitchen," where she cooked up dishes like "unfried" chicken and tortilla casserole on the granite countertops. Yearwood, a Georgia native, has published three cookbooks. The Southern star, who married Garth Brooks in 2005, has owned the five-bedroom, six-bath home since 2000. The couple have another home in Oklahoma, but The Tennessean reported recently that they are moving their home base to Nashville. Yearwood's home at 9324 Concord Road, Brentwood, Tenn., 37027 is listed for $2.2 million. The traditional-style home includes a master suite with two bathrooms on the main floor, custom millwork, two gated entrances and a pool.